How do you put a 13-ton hat on a giant statue? That’s what a team of researchers is trying to figure out with their study of Easter Island statues and the red hats that sit atop some of them. “Lots of people have come up with ideas, but we are the first to come up with an idea that uses archaeological evidence,” said Sean W. Hixon, graduate student in anthropology, Penn State. Rapa Nui –Easter Island, Chile — sits in the Southern Pacific Ocean more than 2,000 miles from Chile in South America. The island is about 15 miles long and 7.6 miles wide at its widest with an area of about 63 square miles. According to the researchers, the island was first inhabited in the 13th century by Polynesian travelers. 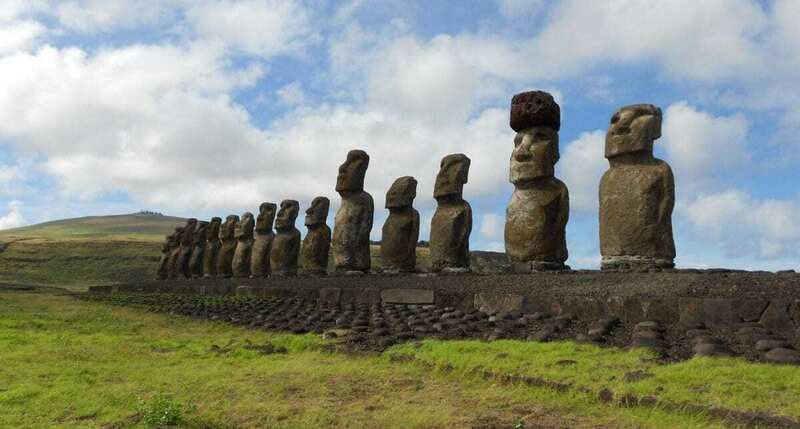 The statues, carved from volcanic tuff, came from one quarry on the island, while the hats, made of red scoria, came from a different quarry 7.5 miles away on the other side of the island. Previous research by Carl P. Lipo, professor of anthropology, Binghamton University, and Terry Hunt, professor of anthropology and dean of the Honors College, University of Arizona, determined that the statues, which can be up to 33 feet tall and weigh 81 tons, were moved into place along well-prepared roads using a walking/rocking motion, similar to the way a refrigerator is moved. “The statues were moved in a fashion using simple physics-based processes in a way that was elegant and remarkably effective,” said Lipo. Not all statues made it to their final locations, and the fallen and/or broken ones showed that, to move them, the statues were carved so they leaned forward and were later leveled off for final placement. The hats, with diameters up to 6.5 feet and weighing 13 tons, might have been rolled across the island, but once they arrived at their intended statues, they still needed to be lifted onto the statues’ heads. The islanders probably carved the hats cylindrically and rolled them to the statues before further carving the hats to attain the final shapes, which vary from cylindrical to conical and which usually have a smaller cylindrical projection on the top. Chips of red scoria are found in the platform of some of the statue hat combinations. “We were interested in figuring out the method of hat transport and placement of the hats that best agrees with the archaeological record,” said Hixon. The researchers took multiple photographs of many Rapa Nui hats to see what attributes of the hats were the same throughout. Using photogrammetry and 3-D imaging, they created images of the hats with all their details. The only features they found the same were indentations at the bases of the hats, and these indentations fit the tops of the statues’ heads. If the hats had been slid in place on top of the statues, then the soft stone ridges on the margin of the indentations would have been destroyed. So the islanders must have used some other method. Previous researchers suggested that the statues and the hats were united before they were lifted in place, but the remnants of broken or abandoned statues, and other evidence for walking the statues, indicates this was not the approach used and that the hats were most likely raised to the top of standing statues. Many of the hats left around the island are much larger than those placed on statues. “The best explanation for the transport of the pukao (hats) from the quarry is by rolling the raw material to the location of the moai (statues),” said Lipo. “Once at the moai, the pukao were rolled up large ramps to the top of a standing statue using a parbuckling technique.” Parbuckling is a simple and efficient technique for rolling objects and is often used to right ships that have capsized. The center of a long rope is fixed to the top of a ramp and the two trailing ends are wrapped around the cylinder to be moved. The rope ends are then brought to the top where workers pull on the ropes to move the cylinder up the ramp.